You know what I have too many of? T-shirts. There are t-shirts in my closet that I've had for years and never worn. Band t-shirts, random promotional t-shirts, fun-run t-shirts, hand-me-down t-shirts — whether scoop or V or crew, t-shirts basically go to my wardrobe to sit around in neatly folded piles, collecting guilt. One day this summer, I was "talking" with Lux Alptraum, the proprietor of our wonderful sister blog Fleshbot [which is thoroughly and definitely NSFW] on IM, which is how I communicate with all of my colleagues because I am antisocial and that way nobody has to know when I'm not wearing pants, and she told me she'd recently turned a t-shirt into a pillow. The shirt had a cool design on the front, but it was too big for her and she never wore it. The pillow looked really cool. Probably a lot cooler than the original shirt had. And there is probably not much that's easier than turning a t-shirt into a pillow! You cut it out, you sew it, you stuff it, and you're done, folks. I thought 'We have to turn this into a DIY!' So, one recent Saturday, Lux came over and we made t-shirt pillows. The shirt I used bore the name of the college I graduated from. I believe my parents bought it for me at one of those ubiquitous Made In China school-memorabilia shops in 2005 or 2006; when I pulled it out of my closet, it still had tags on. This is a vastly better use. 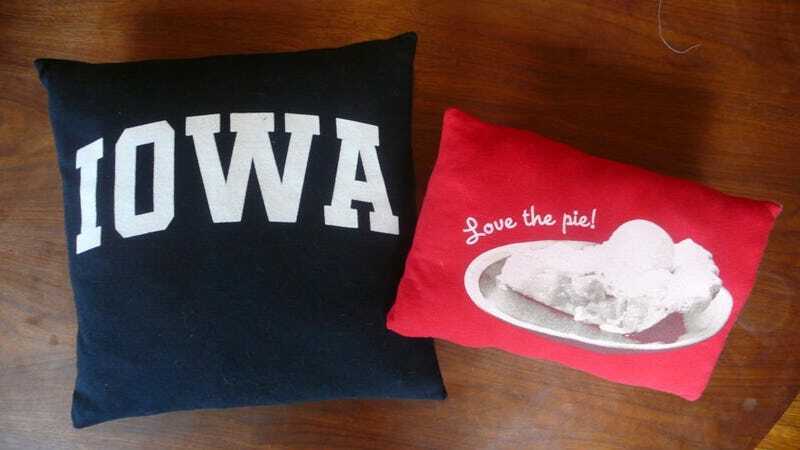 This DIY will show you how to make a t-shirt pillow in two different ways: one uses a pre-made pillow form from a craft store (my pillow), and the other uses polyester batting or polyfill for a custom shape (Lux's pillow). Of course, if you'd prefer not to use a t-shirt, you could make a pillow out of any fabric you wanted. Here's what you'll need, clockwise from top left: 1) A t-shirt you want to donate to the cause. 2) Sewing scissors. 3) Matching thread. 4) Either a bag of polyfill OR a pillow form. 4) Newspaper or butcher's paper, for drafting a pattern. 5) Measuring tape. 6) Pins and needles. Click any photo to enlarge. Lux opted to turn her t-shirt into a rectangular pillow using polyfill. She measured the pattern on her shirt and did some basic calculations to center the picture of the piece of pie. YES, Lux is Team Pie. It happens, even in the best of homes. But the important thing is I love her, okay? We work it out. I opted to use the pillow form, which turned out to be a 13"x13" square. Lux and I each measured and cut a paper pattern, and pinned it to our shirts. Lux cut through both layers of her t-shirt to make a front and a back pattern piece in one go. Which resulted in this. Neat! I cut my front and back pattern pieces out separately. Here's the front, cut out of one layer of the shirt. For the back pattern piece, to cover a pillow form, you need a lapped edge. I cut out two pieces, each about 2/3 the size of the full square, and I cut them out on the shirt's edge so I wouldn't have to hem them. Then I overlapped them to make an even square. Lux turned her pattern pieces right sides together, and pinned them. For a polyfill pillow, stitch almost all the way around. But be sure to leave a gap wide enough for you to insert the stuffing (the edges of the opening are here marked with pins). And then stuff! Polyfill has a habit of separating into lumps over the life of a pillow; to avoid this, make sure your polyfill is as fluffy as possible to start out with (tease it with your fingers if you need to), and stuff your pillow pretty tightly. That gives the polyfill less room to shift around and lump together. Meanwhile, I sewed the pillow-form pillow. As with the polyfill pillow, do it with the right sides together. In contrast to the polyfill pillow, you can stitch the whole way around, because the opening is in the back pattern piece. I clipped my corners for easy turning, because perfectionism dies hard. Turn the pillow cover right side out, and slip the pillow form in through the lapped opening in the back. When you're done stuffing the polyfill pillow, thread a needle and hand-stitch the opening closed. And here are the finished pillows. If there's something you'd like to see as a DIY project, you know what to do. In the meantime, to check out past DIYs — including how to tailor a dress, how to make an envelope clutch, and how to do a '30s-style moon manicure — click here.